For want of the kind of screen recording software we have on PCs (Jing comes to mind), it's not possible to get high quality video images from a phone. But, static images aren't a problem on the iPhone and only slightly more difficult, and inconvenient, for the Android phones. It's moving images that are a challenge. 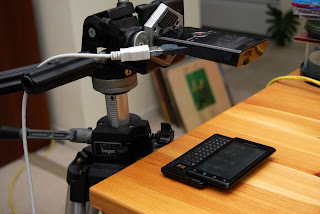 Because I need to tell a story with video from my phone, I spent hours trying different configurations of phone position vs. camera position to record my Motorola Droid's images onto my Kodak Zi8 video camera. The camera's not very high-end, but it does have a limited macro setting and a few other key features. At $180, it fit what I could spend on a camera. Some configurations involved clamping the phone vertically on its side (to best fit the aspect ratio of the camera) and created the concern that I would damage the phone's case. Believe me, I was very careful and even added neoprene pads to the clamps. I finally came up with the simple solution below. 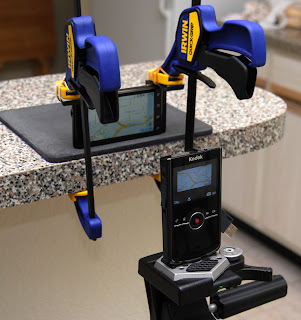 I may have to brace the phone slightly to prevent its moving, but no stress on the case from clamps. It took longer than it should have, but it came to me that it was easier to adjust focus by changing the height of the camera via the crank. Too bad I didn't think of it sooner. Opening the keyboard forces the screen to go horizontal and doesn't require the Droid to be upright on its side. For all that effort, this is the quality of the image I get ... serviceable, but not the quality I'd like to have. (it was recorded at 720p). Just a few weeks ago, I had no concerns about recording phone images of any kind. Now, I'm learning. It makes me wonder if it isn't easier to tell my stories with static images.